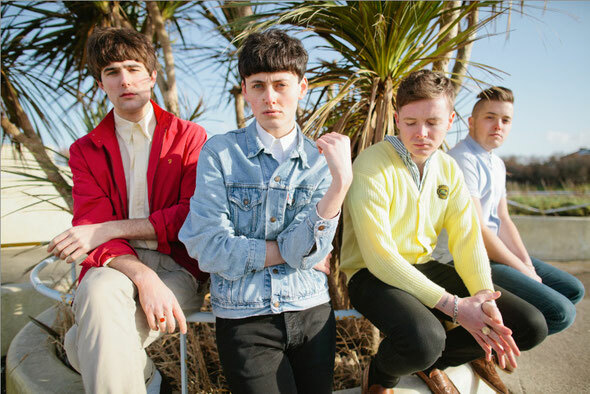 Morecambe four-piece The Heartbreaks will release new single ‘Delay, Delay’ on April 30th followed by their eagerly awaited debut album ‘Funtimes’ on May 7th, both released on Nusic Sounds. The band are also giving fans a free download of album track ‘Winter Gardens’ exclusively through their Facebook page and website to download now. Since the release of their last single ‘Jealous, Don’t You Know’, The Heartbreaks have packed a great deal into a short space of time. Newly signed to emerging independent label Nusic Sounds, along with recording their debut album in London and playing at summer festivals, The Heartbreaks supported both Morrissey and Hurts across Europe playing to arena and theatre filled crowds of more than 200,000 people in total and picking up many new fans along the way. The lead single from the album ‘Delay, Delay’ is an uptempo, punchy indie pop song with melodic vocals and majestic guitars about young romance and growing up in a small seaside town. ‘Winter Gardens’ is an ode to their hometown of Morecambe with fast paced jangly guitars and exhilarating, accelerating vocals throughout. ‘Funtimes’ is a 10-track collection of bright, witty and youthful anthems. It combines ferocious, rattling drums and chiming guitars with Motown hooks that come together with the knowing swagger and melodic lushness of all great life affirming pop. All of this is enriched by soaring and swooning vocals of bittersweet lyrics about a love of melancholy Morecambe and the trials of everyday life combined with a shimmer that displays a love of Northern Soul 45s and the girl-group soul of The Ronettes and the Shangri-Las. The sound is as classic as the ideas and musical influences behind it. The album was produced by Tristan Ivemy (Babyshambles, Frank Turner, The Holloways) with additional production from Joe Cross (Hurts, Sound of Arrows) and the track ‘Remorseful’ by Edwyn Collins and Sebastian Lewsley. During the last year, The Heartbreaks have performed alongside Carl Barat, The Killers, Kaiser Chiefs and The Courteeners along with performing for Bono in Milan, Burberry in New York and Kitsune in Paris. The foursome, from Morecambe, formed in May 2009 after growing up together bonding over shared passions; Motown, bittersweet romance and the English seaside.